If you’re like me, you probably have a pit mat or two along with a several magnetic trays to hold your screws and small parts, while you’re building or wrenching on your R/C. Well a company called Cow Performance has made a pit mat that does it all, called the Screw Catcher. 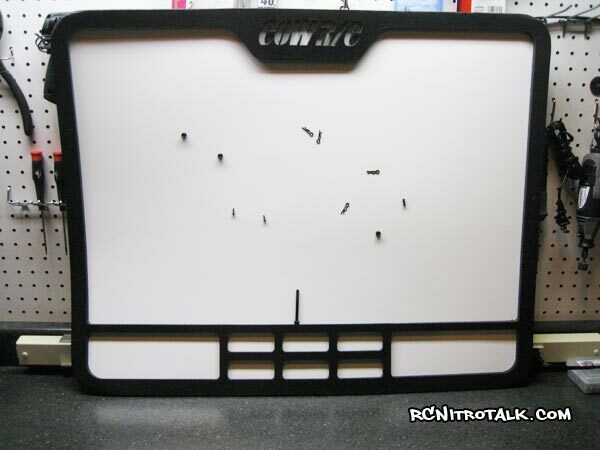 The Cow Performance screw catcher R/C Mat is a 60 mil non transferring reverse magnetic, matte white work surfaces. Combined with permanently bonded closed foam part compartments! Almost sounds to good to be true, keep reading and to see what we thought about it. We got to review the Cow Performance jumbo screw catcher, the jumbo screw catcher measures in at 24″x30″ and it’s HUGE! In fact I normally wrench on my R/C’s using Upgrade-RC’s pit mat, which it too is huge, however the Cow Performance screw catcher pit mat is even larger than it! 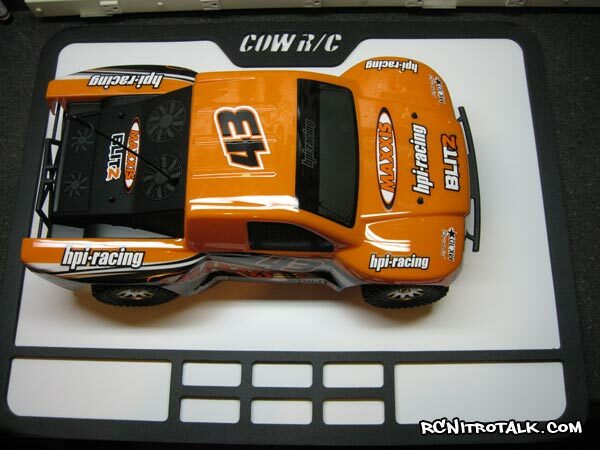 Both are about the same length, but the Cow Performance screw catcher is much taller than the Upgrade-RC pit mat. To further show you how large this mat is, you’ll see below my HPI Blitz short course truck sitting on the mat with plenty of room to wrench on it, fully surrounded by the mat. Not even a HPI Baja SS is to large for the pit mat. 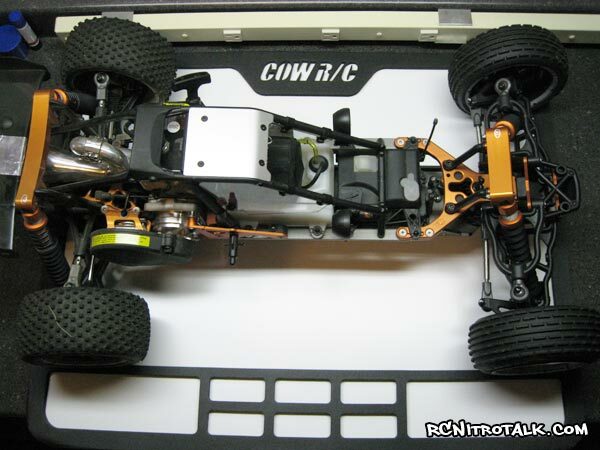 The HPI Baja SS fits the mat nicely but also has room to hold screws, parts, and tools with not to much trouble. 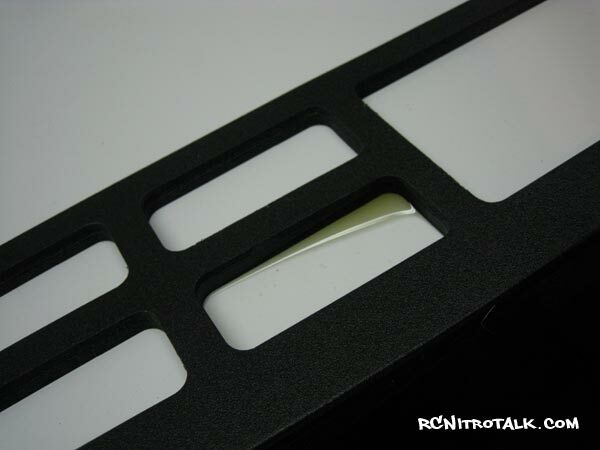 So you might be thinking this is no big deal, your Upgrade-RC mat / towel / bench does all this already. Well that’s about where all the comparisons stop. Not only is the CowRC screw catcher huge it’s also thick, in fact the closed foam that borders the pit mat and divides the different compartments is nearly a 1/2″ tall. Thus the reason it’s been named the Screw Catcher. Screws, e-clips, washers, nuts, all find a hard time getting away from this mat. Add to the fact that the entire backing of the pit mat is magnetic, just adds to the fact screws don’t go far. To test this I dropped several screws, nuts, washers, and clips onto the mat then then even place the mat standing up to see if the magnetic backing of the mat was strong enough to hold them. The Cow Performance Screw Catcher handled all of the parts with ease, even while setting the pit mat up to stand. 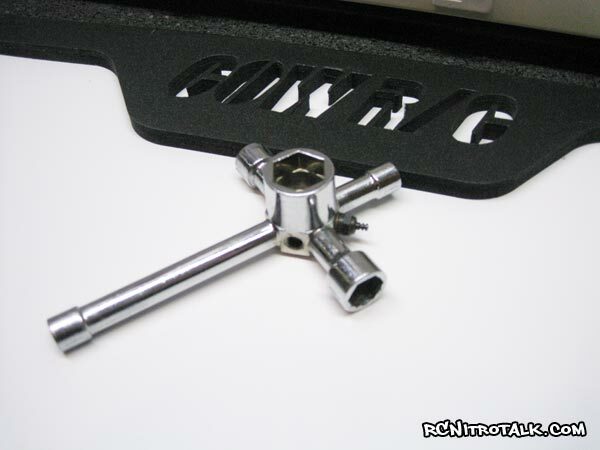 The only screw that manged to break away was a large heavy screw used in the HPI Baja SS. Even still, while the magnetic backing might not been enough to stop it the thick walls of the pit mat was! 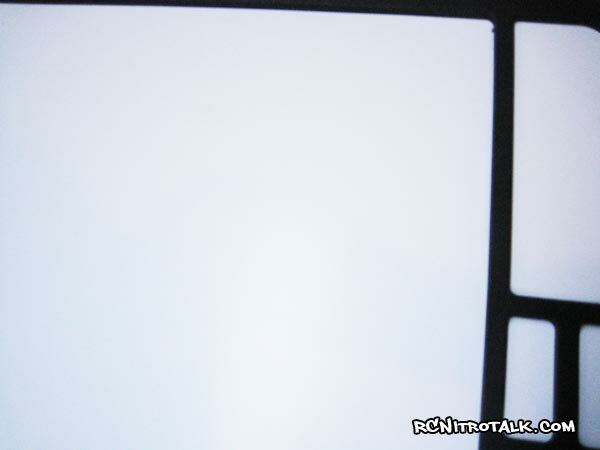 The bright white background of the mat made all the screws very easy to see, even the shiny parts was easily found. The next thing I wanted to check out was how well the mat cleaned up. So the first thing I did was to pour fuel into one of the screw compartment to see if it would leak through into the other compartments, it didn’t. 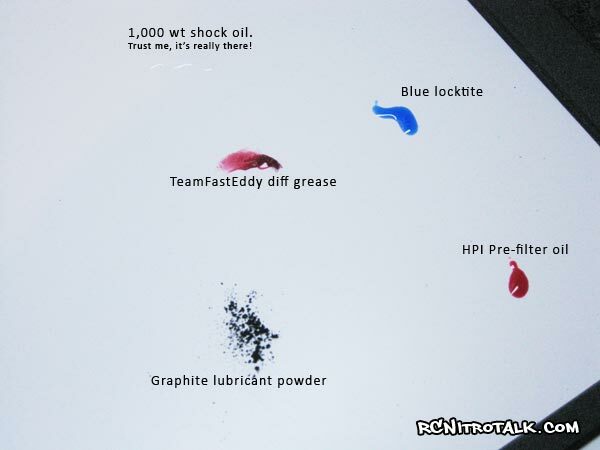 Next I took shock oil, diff grease, graphite powder, locktite, and pre-filter oil and place various amounts of it on the mat. I let all of this sit on the mat for 15 minutes before I tried to clean the mat. 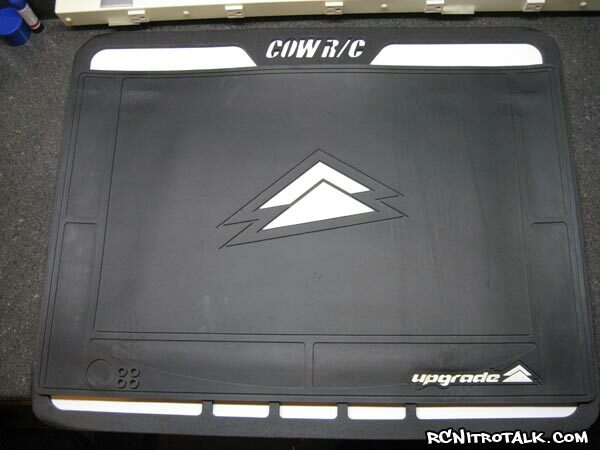 Being that the CowRC pit mat has a very nice white background I figured a number of these items would easily stain the mat and be pretty noticeable against the white. After the 15 minutes I grabbed a dry rag and proceeded to wipe everything up. 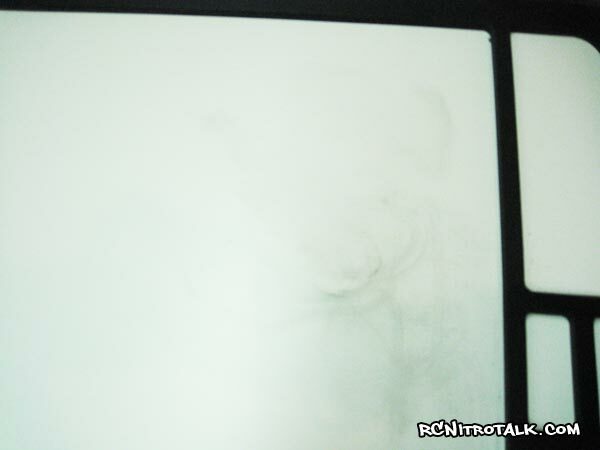 Everything came up clean with no staining except the graphite powder. Which honestly I knew this would give the pit mat heck as graphite powder is very messy and tends to stick to everything. But with one quick squeeze of a bottle containing a mixture of Simple Green and Water and using the same dry rag I was able to bring the pit mat back to new. Overall I’m impressed with the Cow Performance Screw Catcher pit mat. The jumbo screw catcher pit mat offers a very large workspace to build and wrench on your R/C’s of any scale. The while background makes all RC hardware really stand out so no more trying to find black screws against a black table or other pit mats, add that to the fact that the CowRC pit mat is magnetic and does a good job at catching and holding the screws is very nice. The parts and screws compartments are also a nice added bonus, especially while building RC’s, just empty your parts bags into each compartment and you’ve still got plenty of space. The only downside I could really find on the CowRC pit mat was the fact that since the entire backing is a magnetic, bending the pit mat such as rolling it up doesn’t work very well. The magnet isn’t that flexible thus making the pit mat a little cumbersome to carry in a hauler bag out to the race track. With that said, CowRC has said they already have in the works a carrying bag for the mat that will be included for free! – Unable to roll up the mat makes it harder to carry around. 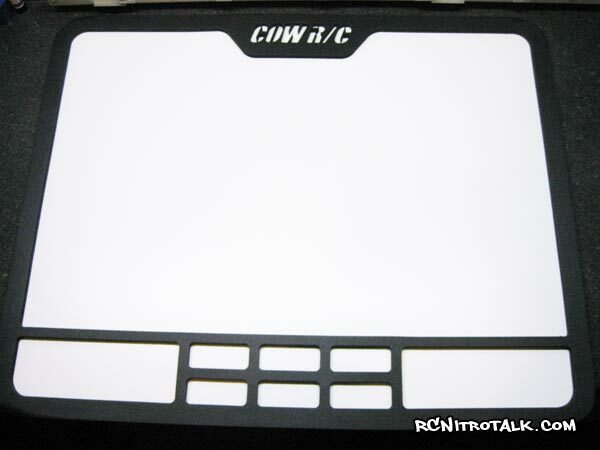 I recommend anyone looking for a pit mat, be sure to check out CowRC. CowRC also offers two other sizes (Micro Mat: 9″12″ and Mini Mat: 12″x18″) in case you don’t need something this large.